» A Movie Review by Walter Albert: THE STOLEN VOICE (1915). A Movie Review by Walter Albert: THE STOLEN VOICE (1915). THE STOLEN VOICE. World Film Corp., 1915. Robert Warwick, Frances Nelson, Giorgio Majeroni, Violet Horner, Bertram Marburgh. Screenwriter/director: Frank Hall Crane. Shown at Cinefest 28, Syracuse NY, March 2008. When society matron Belle Borden (Violet Horner) is entranced with the world-famous tenor Gerald D’Orvilie (Robert Warwick) her jealous suitor, the sinister mesmerist Dr. Von Gahl (Giorgio Majeroni) renders D’Orville mute. Belle immediately loses interest in the silenced tenor, who travels abroad, exhausting all of his fortune in an attempt to recover his voice. Reduced to utter penury, Gerald is rescued by someone he once salvaged from the refuse heap of humanity, rising to new heights as a silent screen star. When Dr. Van Gahl sees Gerald in his new-found glory on the screen he has a fatal heart attack, which immediately restores Gerald’s voice. 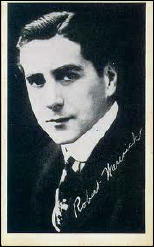 Editorial Note: Robert Warwick’s movie and television career began in 1914 and did not end until 1962, two years before his death, with a substantial combined 242 total credits on bot screens. Moviewise, his roles seem largely to have consisted of minor roles in bigger films, and bigger roles in B-movies. Catching my eye, though, looking down through the list of movies he appeared in, are several he made for Preston Sturges in the early 1940s: The Great McGinty (1940), Christmas in July (1940), The Lady Eve (1941), and Sullivan’s Travels (1941). He was third-listed in the latter, after Joel McCrea and Veronica Lake. Warwick was so ubiqitous in films that even before I saw his name here I recognised him in the photograph. Surely he was one of the busiest of Hollywood’s character actors. Someone should so a book on movies and hypnotism from CALIGARI to Preminger’s WHIRLPOOL and John Huston’s FREUD. Franz Mesmer, Count Cagliostro, and George Du Maurier’s Svengali were certainly responsible for a lot of melodrama — thankfully much of it pretty good.